There is abundant evidence of diverse life forms in the Proterozoic. In their review of Paleoproterozoic microfossils, Hofmann and Schopf (1983) listed 122 taxa (including 23 dubiofossils and pseudofossils) in ~40 different biotas (2.5-1.6Ga); this number does not include microorganisms that were not named. 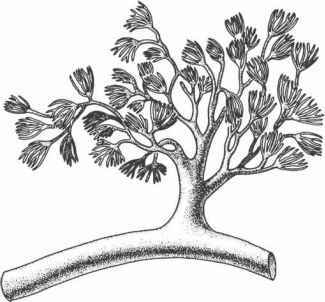 They classify these genera into five morphological categories: (1) coccoid uni cells; (2) septate, unbranched, filaments; (3) tubular, unbranched forms; (4) branched filaments; and (5) bizarre or unusual forms, that is, those with unusual morphologies and uncertain affinities. 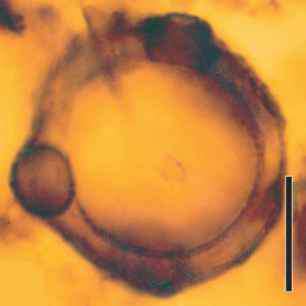 Coccoid forms dominate most Paleoproterozoic assemblages, both in terms of diversity and abundance. In contrast to later Proterozoic and early Paleozoic forms, they generally exhibit a simple and unornamented morphology and are relatively small (<25 ^m; most are 2-7 |m). 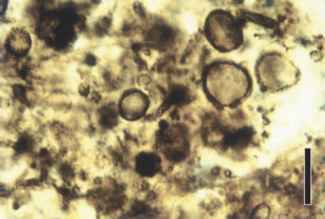 Included in this classification would be coccoid forms that occur in colonies which are usually surrounded by a sheath-like structure. Septate filamentous forms are also usually small and simple, ranging from 1 to 2.5 | m in diameter and generally not surrounded by a sheath. 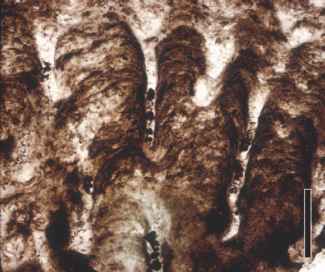 Tubular microfossil forms are less commonly found and many appear to represent the remains of microbial sheaths, similar to those in modern filamentous cyanobacteria. Branched filaments and unusual forms are relatively rare in most biotas. Based on their size and simple organization, Hofmann and Schopf (1983) considered all of these forms as representing prokaryotes. Thus, it would appear that Paleoproterozoic biotas were composed for the most part, if not entirely, of primitive prokaryotic organisms. unbranched forms (Animikiea); and unusual or bizarre forms (Archaeorestis, Kakabekia, Eoastrion, Eosphaera) (FIG. 2.23). Huroniospora is a simple, spherical—ellipsoidal form originally described by Barghoorn, that has since been found at several localities with budlike outgrowths attached to the cells (Barghoorn and Tyler, 1965). Gunflintia is a narrow filament (1-4|m in diameter) composed of a single row of cylindrical cells, whereas Animikiea is a broader (6-12 |m) tube that sometimes contains a septate filament. Some of the most interesting forms in the Gunflint micro-biota are those that have uncertain taxonomic affinities. 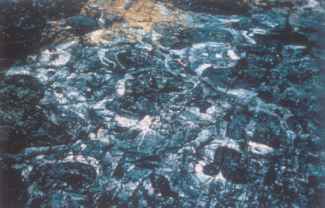 Eoastrion is the name given to a star-shaped group of radiating, filamentous structures considered by most to represent some type of bacterium. 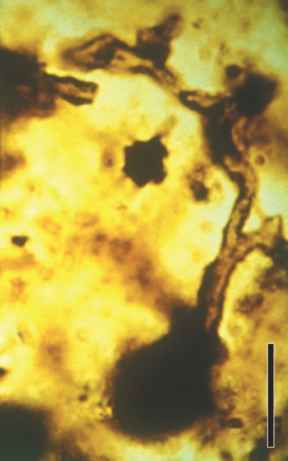 Archaeorestis is a non-septate, irregularly branched organism with filaments that range from 2 to 10 pm in diameter and up to 200 pm long (FIG. 2.24). Its affinities are uncertain, but it has been interpreted as a budding bacterium (Awramik and Barghoorn, 1977) and a possible Kakabekia by Hofmann in Hofmann and Schopf (1983). Kakabekia umbellata exhibits a tripartite organization, consisting of a bulb-like base, a so-called stipe, and an umbrellalike crown (FIG. 2.25 ) ; some specimens extend up to 30 pm in length. The affinities of these fossils continue to remain obscure. with certainty. Although there is noticeable morphological similarity between some of the fossil organisms and certain modern bacteria, it would be almost impossible to categorize many of these fossil organisms without a knowledge of their biochemistry and molecular biology. 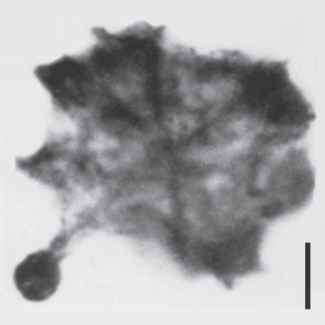 Information on cell morphology alone is not enough to make classification possible. Overall, the types of organisms present in Paleoproterozoic biotas are similar in their morphology and occurrence to both older (Neoarchean) and younger (Mesoproterozoic) types. They differ from those of the Archean by their greater diversity and by the presence of both benthic and planktonic forms. What can be generalized is that there is a trend toward increasing diversity and increasing cell and filament size throughout the Proterozoic.